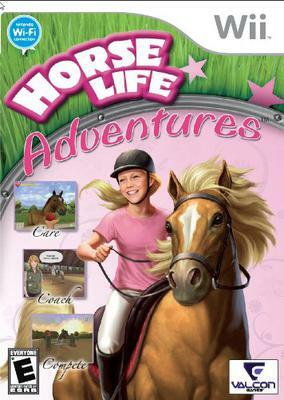 Horse Life Adventures is a cool game! Players will receive a pony as a reward for three years of hard work at their grandfather's farm. Then they can choose their favorite breed, then pick the color, markings, and name of their horse and feed, groom, train, and play with their new pet. Horses take lessons in Dressage, Cross Country, and Show Jumping at the Training Center before gamers head out to test their skills in competitions. The winnings from successful competitions can be used to purchase new clothes, riding gear, and horse treats, and players can always head out for leisurely rides to relax and take photographs of nature. This game is so fun. I have 3 wii horse games and this is totally my favorite! It is so fun. And I have a idea anonymous you could save your money and buy it or you could ask for it for your bday or Christmas. I had to buy 2 of my games and got one for my birthday. I am a kid ok, i don't like asking my parents for stuff but i have always wanted to play this game. i wish we could just download it and then we can play it. This game is awesome and it is the best game to play! I had other games, but they were all very easy and had the same story lines. I would definitely recommend this game to any horse crazy boy or girl! I want to transfer this game and all of the advancements I've made (I'm on level 4) to another kindle since my first one with the game one it is dying. How can I do this? I can't seem to find any way to transfer or backup this game. I don't really want to start all over since it's taken so long to get this far. Does anyone know a way to do this. Any advise will be appreciated. Thanks. I got this game a few days ago and it's already my favorite horse game to play for the wii! I love it and would totally recommend it to anyone who loves horses! I do have a question though, how do you get another horse?? I got this game a few days ago and already it's my favorite game to play for the wii. I defiantly think you should get this game. Ok so I'm playing the game now and I love it but I do agree it is a little easy but way better then gallop and ride and pets horse2. Very fun game. Forget about those negative comments... If you get far enough ahead in it you can buy zebras, mustangs, pink ponies and much more. Also once you have reached a certain point you can travel to africa and the US, (this game takes place in europe). I haven't played it yet, but I really want to know how long it takes to get a horse or if it's way too young for a 9 year old? this is a very cool game, the only negative I can find are : It wants you to clean your horse every time you do an activity, and (for us older kids) it's a bit to easy, and you can't really buy other horses you have to create a new profile. is this game anything like Pony Friends2? i have this game and i like it! yeah the grooming is a bit much, but the riding is fun!! this is the only game i like doing dressage in. I ordered this and i'm supposed to get it soon. Can you go trail riding and stuff? Can you buy more horses? fun but grooming way too much and i can't unlock anything. It's very cute and fun! But it's hard to achieve goals and unlock them too. and the horse needs to be cleaned every minute! otherwise it's REALLY fun! I can't get more horse to jump in training or on hacks. Please help. I've never played it on the Wii but I have it for my DSi and it's pretty fun on there! How is the Wii game compared to the DS game? THIS IS AN AWESOME GAME!! This is the best horse game i have ever played it is sooo much fun. I am on my second profile, i love it! Id highly recommend this for a horse lover!! I would have to say that this is the best games I have ever played. This game was alright. Its fairly simple though. I don't like how you can only own one horse. I didn't even complete the whole game because it bored me. The training is repetitive and very simple. Riding out on the trails is also, too simple. You are limited to the path and that's about all you can do. Is ride on that path. Even the horse care is limited. And the cell phone on the game? Whats up with that. This game is supposed to be for horse lovers not girly girls! I think this would probably be good for the younger game enthusiasts. This game is VERY easy. I beat it in less than 6 hours and got bored. Total waste of money.. The graphics were also stalled and the sound effects and movements were unrealistic. Also in dressage, some of the moves were also unrealistic, which disappointed me since I am a dressage rider. I also did not like using the nunchuck controller stick to move the horse, and prefer the styles seen in Gallop and Ride, where you use both the remote and nunchuck to control the horses. All and all, it was crappy and I was very upset with the game...buy Gallop and Ride!! It's WAY better. 1. when u train ur horse its love will go up but everything else will go down. 2. after you pass each training class u can compete in competitions which is in town. 3. the more competitions u play the more things that u unlock at the end of the jumping contest u win another horse. 4. make sure to take good care of ur horse take it on rides to help its stamina, brush it to clean it,etc. 5. ur horse can be put in the pasture to give him a treat and to stroke him. 6. the more competitions u play the more trails u unlock and the more u get to explore. 7. u can but cute outfits, food for your horse, snacks for your horse, saddles and bridles for your horse, saddle pads for your horse all in the village and if your horse gets hurt or sick u can buy a first aid kit. 8. remember to clean your horse regulars and too keep his stamina up. 9. on the other horses that you win u don't get to pick it, name it, or do anything like u did to the first horse only ride on trails. 10. the most important tip is just to explore and to have fun playing with your new best friend. No... this game is exactly like Horse Life 1. I sort of like Horse Life 1, but it is no fair that horselifeadventures copy horse life 1. NO FAIR, I TELL YOU! She loves this game! I love it too. Pretty great introduction to eventing. this game rocks! if anyone's a horse lover they need this game. it's as if you actually have the horse for your self. I love this game! I'm hooked on it and never want to stop playing once I start. I have also learned a lot about the different types of disciplines that the game has. It is my favorite game for wii. Return to Horse Games for Wii.